I was totally disorientated when I woke up the next day. The room was so hot and felt like it had no oxygen at all. I realised that I’ve probably never been anywhere for so long where there really isn’t any light. Usually there’s a bit of moonlight or a street light poking through the curtains or even the little red dot on a TV or alarm clock. But there was nothing. I stumbled around for a few minutes while I fell over the contents of my backpack that were scattered around the room before I finally found the door. There were two specs of light at either end of the corridor and in between I could just about make up mattresses and tables lining the walls. A make shift kitchen had been set up along our corridor and the women who worked there had massive pots and frying pans on gas stoves that were bubbling away in the dark. 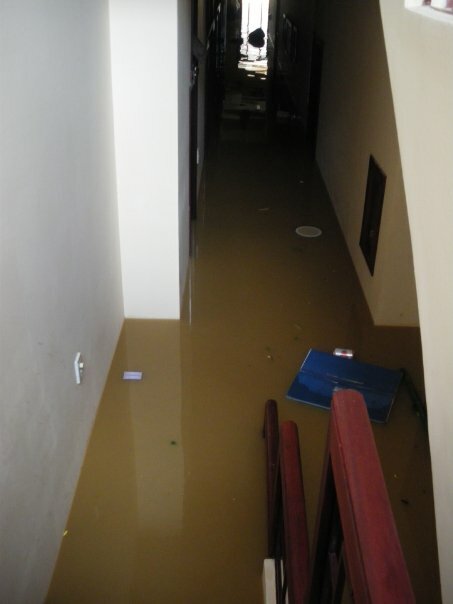 I felt my way along the corridor to have a look outside and see what was going on and how the flood water was going. There was a massive crowd around the window so I couldn’t really see but I got the gist of what was happening and could just about see muddy brown water gushing thought the street: Typhoon Katrina had hit that night and the banks of the river had to be opened before they broke so the flood water had risen by about 5ft! The whole of the ground floor had been flooded which was why the kitchens were now on the second floor and people were now sharing rooms to accommodate the poor people whose bedrooms were on the ground floor. There were a couple arguing with the hotel staff saying that they had a flight to catch and had to leave ASAP. Everyone was trying to ignore them because it was clear we weren’t going anywhere for a fair few days. I’m not much of a morning person and gathered that it would be another long and boring day so I planned on crawling back into bed. But the ladies cooking breakfast wouldn’t have any of it. I had a strange breakfast of noodles and hot dog sausages with fruit and a fried egg. We sat on the staircases and ate our strange breakfast and pretty much all we did for the next 2 days. This was the only place in the hotel with any light and although we were constantly in the way, we couldn’t face sitting in our dark rooms. I did nothing but read, eat noodles and sleep our sweaty, dark, mouldy room. I have a few icy cold showers to break up the day but it was much more difficult than you’d think in the pitch black. I think it was the 2rd day when the rain finally passed and the sun came out. 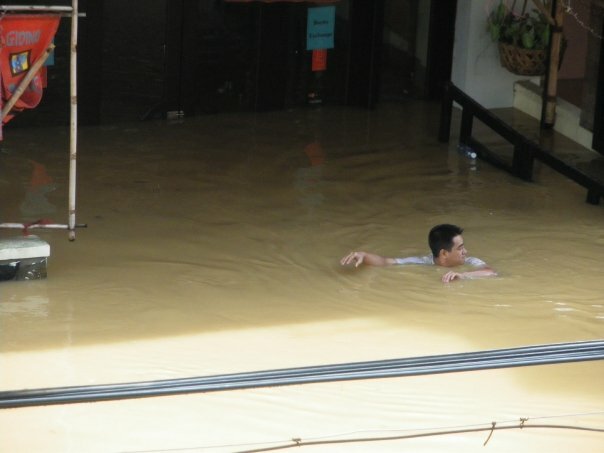 The water was still about 1.5 meters high but we had the rooftop pool so we sat there all day, sunbathing and swimming and I almost forgot that there was a flood below us and so many people had lost their homes. 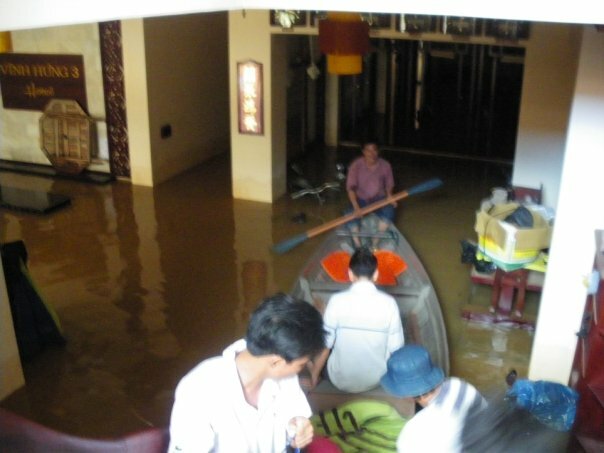 All the staff moved into the hotel because their houses were on lower ground and had been flooded. They slept on mattresses in the corridor on the 3rd floor but it seemed as though they never slept. They were constantly cooking and cleaning and looking after us. There was one little guy who was like a miniature action man. He had so much energy and was constantly in and out of the water while swimming things across the road including temporary power and internet cables. The computers were all moved up to the second floor and it seemed strange that we had no hot water, no lights, no air con and no kitchen but we did have the internet! There are just some things we can’t live without. Boats pulled into what was once reception bringing supplies. One night Dara worked his charm on an ‘old friend’ who brought us takeaway. Her restaurant was on slightly higher ground so it wasn’t flooded but to get to us she had to wade through the water with pizza boxes on her head and then just in a boat when the water got too high. I felt terrible when I saw the poor lady but it was so nice to have something other than rice and noodles to eat. We were suppost to leave Hoi An after just 2 nights but we stayed 5. We were so pleased to get out of the hotel and walk along the street in the sunshine. We would have taken an overnight train out of the city but the train track had been washed away with the flood so we flew to Hanoi, the capital of Vietnam. We’d previously all moaned about how much time we spent on buses, trains and planes but it was such a luxury to be out of the hotel and among new people and breathing fresh air and seeing new faces. Packing in the dark had been a nightmare and I knew I must have left half my stuff in the room, tucked away in the corners, but I didn’t care. I was just so pleased to be out of there!